****o all. 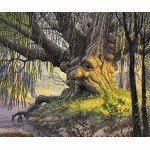 I am new here, but love to learn from forums. I recently bought a home in Leesburg, Florida that has a 4 zone sprinkler system. We do not live there yet, but will live there full time in 3 years. Now, we just visit there about 4 times a year. I have one valve that looks like it is leaking a bit. I'll try to post a picture here of it. I would like to fix it myself. I do not know too much about sprinkler systems, but have read a bit about them. I am no novice to building and fixing things......I built my own house here in western NY, but I'm not too used to "southern building". I'm used to basements, 42" frostlines, etc,etc. Hardly anyone has sprinkler systems here in NY state. They are richdel 1" valves. 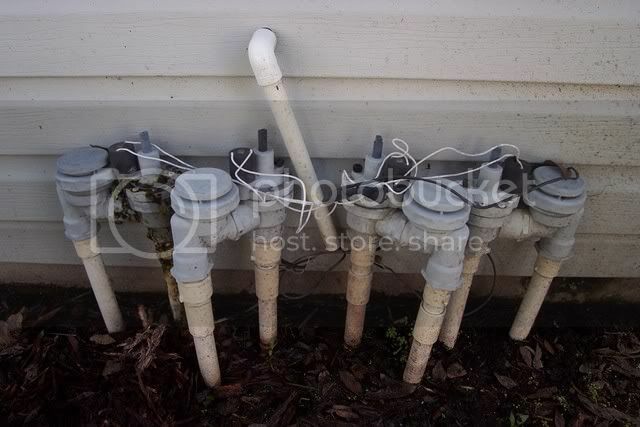 They look easy enough.....just cut the plastic pipe, replace the valve, and reglue new fittings to the pipe with some couplings, allowing enough pipe for future fixes.......then re-wire the low voltage wiring. I just do not know where to get these valves, and if I should just try to fix the one leak, or replace all the valves. The sprinkler system seems to be working fine, but that one has a small drip, resulting in a soggy area right around that area. I will be down there again in December, and would like to fix it then, if it could wait. Also, does it look like it is up to code? Is it anti syphon? Thank you in advance for your kind help. When you say repair, do you mean replace, or just take apart and rebuild? I noticed that the one on the far right is a bit marred up by where the wires are. Everything works fine, but I know it needs to be fixed so it could dry up. My neighbor told me I should just replace all of them because they are probably about 15 years old. I will if I should, but money is a bit tight owning two homes, and I'm not looking to spend money where I do not need to, unless it is a good idea. Also, I do not see a shut off valve anywhere....the main water shut off for the whole house is on the other side of the house. I have no problem shutting off all of the water for awhile if I need to. Does it look like they are too low to the ground? Should I raise them? Do you recommend any upgrades? It looks like these are 2713APR 1 inch valves. They look almost idential, except for a little thingy just under the solenoid. They also say something about having both APR and DPR available. What does that mean, and which one do I have? Hi Frank, they don't make that valve anymore (713APR) but you can still get parts for it. They've redesigned it and are calling it the 2711APR. They do make the 205 which is the inline version of the 713APR. All you need it the diaphragm for a 1" 205. You could just try tightening up the screws on the vavle. Good luck! Thank you. I guess when I'm back down there I'll shut off the water and clean up that one valve to see where the leak is coming from..........then take it from there. So you don't think I need to replace all of them? I've studied the picture for a bit. If I ran across those valves I'd suggest to the owner they change all 4 valves. They're inexpensive enough. You said you wanted the cheap way out for now. The valve on the left has mold on top of the bonnet so maybe the leak is coming from under the solenoid. Possibly it's not tight or the O-ring is missing. Pictures can be deceiving. The two valves in the middle have been cut out at one time for whatever reason. They may have been replaced but are still old. The second valve from the left has a newer looking bonnet on it. The ground looks very wet but again it's hard to tell from the picture. That might be mold on the foundation behind the valve on the right. Having anti-syphon valves that close to a foundation could be a problem. Especially if you get a lot of drainage after the valve shuts off. If one's causing a major problem I'd put a spring loaded check valve in the lateral line. Those pipe are very dirty. I'd clean them with sandpaper and then primer where you're gluing the couplings. That about does it, good luck! I will probably replace all four of them in December I guess. We'll see. My friend across the street has almost everything the same, so if I replace his, we should have enough for a decent order. The ground is wet around them, all due to that one that is leaking. It wasn't leaking the last time we were down there, so it just started within the last few months. What would be the best model number to replace these with? I think I may carefully dig around there a bit to learn a bit more how this system is....I do not quite understand the piping of these things......(like I said, I'm a bit new to this Florida stuff...) I'll also check into the suggestion of a check valve, and do that once I learn about "laterials", etc........I assume that is either before or after the first or last valve, probably after, to prevent backflow. I'd like to get that area dried up......there are things living in that goo that I've NEVER seen up here in NY...! With your kind help, I'll be a lot smarter by December! They look very much like my controls, so I assume these are anti syphon control valves, so I would need 4 of them.......you have 13? Wow, a big system. It sounds very scary to have your drinking water contaminated.....with a 15 year old system, I want to learn enough to have a safe system that will not break down when i'm 1200 miles away. I have neighbors watching it, and one neighbor resets my system when he thinks I should water more, but I want to learn a bit more about them, and learn if I need anything.